When considering whether to purchase a particular brand of tiny home, it’s important to decide what basic components of tiny homes you prefer most. It’s important to consider what aspects of the tiny home design are most important to you so that you better search out your ideal. We looked for some universals in tiny home design and found a handful of components that maximize space and usefulness and minimize extra substance. 1.) Loft spaces- many tiny homes, including Wheelhaus tiny homes, will maximize space by adding in vaulted ceilings to create a loft space. Often used for bedrooms, these spaces utilize every nook and cranny with a building shape. They make excellent storage spots and can be designed to allow someone to easily walk through it. 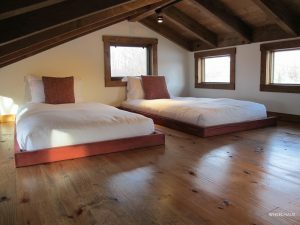 A great example of a loft space would be the Caboose, where the loft space can be added to create an additional sleeping room. 2.) Wet baths- An integrated toilet and shower minimizes the amount of space needed for your bathroom. Hence, many tiny homes will use a “wet bath” to utilize the space efficiently. Wheelhaus’ new RoadHaus is a prime example. 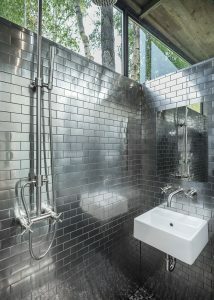 The wet bath integrates a shower, toilet and sink into one room, minimizing the space needed for the total bathroom. 3.) Light!- Light allows a space to feel big. Ever noticed how a dark-painted room feels small? By allowing extra light into a tiny home, you can maximize the feeling of space in the tiny home. Our Lighthaus and Lookout models demonstrate how effective light is at making a space feel large. 4.) 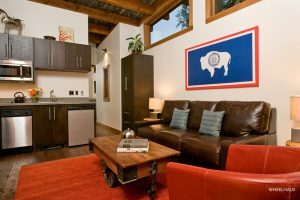 Multipurpose spaces- Let’s be frank…tiny homes mean tiny spaces. Thus, rooms within the home need to serve multiple functions. Your kitchen and dining room need to be combined. Your living room needs to double as a TV room and guest room. 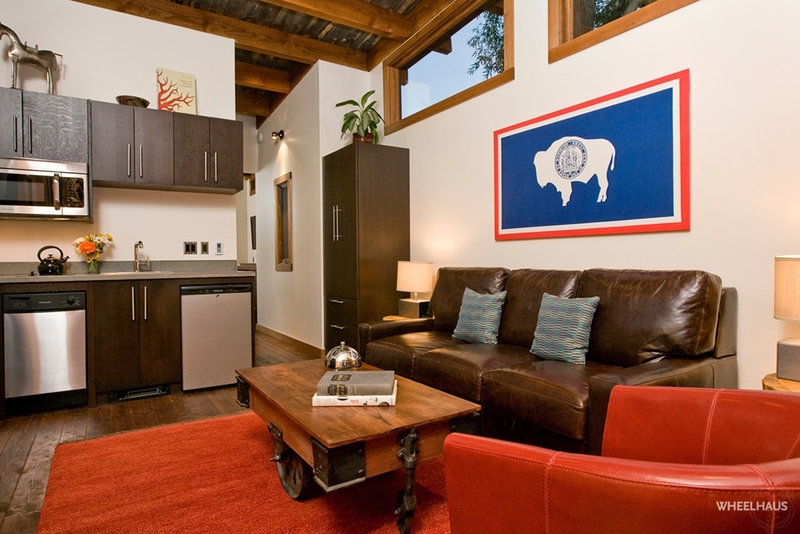 All spaces within your tiny home need to be utilized efficiently so as to best serve all the needs you have. Our Wedge Model best demonstrates this needed functionality. The kitchen and dining space are combined by including an island, and the living room doubles as an extra sleeping space and TV room. 5.) Outdoor Living- Tiny homes means you spend a lot of time outside. Having a tiny home that integrates outdoor living is key. Many of our Wheelhaus homes include large decks that allow for covered outdoor living. The Flat Roof Caboose maximizes outdoor living with the inclusion of a large upstairs deck. 6.) Storage- In some tiny homes, extra storage can be found in the flooring or loft areas. In other tiny homes, the extra storage is integrated in the living room furniture and under the bed. The point is that most tiny homes utilize the space efficiently by integrating storage in spaces where it otherwise would not be. 7.) 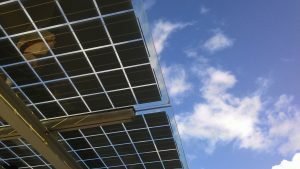 Energy efficiency- Many tiny homes integrate energy efficient appliances and utilities to minimize the effect on the environment. Some tiny homes will use solar panels to allow you to completely go off the grid. All of Wheelhaus’ tiny homes utilize these energy efficient practices, from water-saving faucets to our green production standards. While we mentioned that these are universals, not all tiny homes will contain these components. Furthermore, you will want to consider if a particular basic component of tiny homes is more important to you than other ones, especially since the design of a tiny home can vary greatly depending on the inclusion of a particular component. IE, a tiny home with a loft space might decrease the amount of light that comes into a home. If you need help figuring out which Wheelhaus model best meets your preferred needs, please do not hesitate to contact us at 307-733-7700! We have just the model for you!